I don’t know why I did this but early last week I decided that today I would preach on the story about Abraham and Isaac (Genesis 22:1-14). We often call it the sacrifice of Isaac. 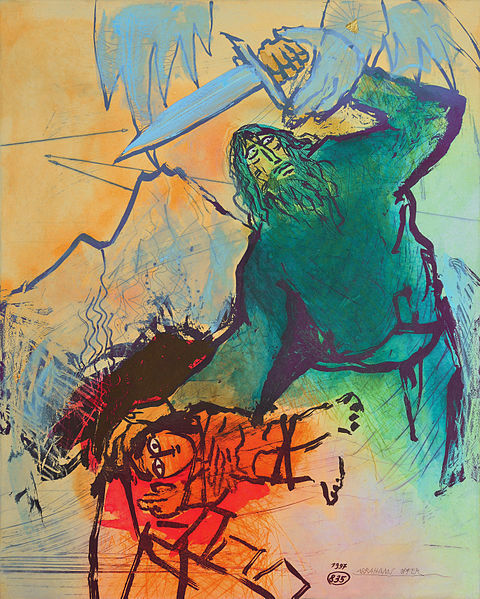 The Jewish tradition calls it the binding of Isaac or the akedah. What in the world was I thinking about? The longer the week went on the more of a conundrum this story became. I thought of my friend Rabbi Joe. We spent time together at a conference last summer. I asked him what they, the Jewish tradition, do with this story and others like it in which God seemingly commands killing others. “Nothing,” he said. “That’s not who God is. We ignore them.” Then he went on to tell me about midrashim, the stories and commentaries that rabbis throughout the centuries have written in an attempt to understand, explain, and resolve this text. Apparently, Judaism struggles with it as much as do you and I. The longer the week went on the more I wished I had taken Rabbi Joe’s advice and just ignored it but here we are. “Take your son, your only son Isaac, whom you love, and go to the land of Moriah, and offer him there as a burnt offering on one of the mountains that I shall show you.” According to the writer of Genesis, these are the words Abraham heard God speak to him. I cannot resolve this story for you or myself. I doubt anyone can. Maybe the best we can do is to honestly and deeply engage and struggle with the text, ourselves, and God. While we do that let’s also be mindful that we are always tempted to say more about God than we can really ever know. The traditional interpretation is that Abraham proved his faithfulness by his willingness to sacrifice Isaac. And we uphold him for that and name him the father of our faith. He is the father of Judaism, Christianity, and Islam. But here’s what I want to know. Do you really believe that God told Abraham to kill Isaac? Is that consistent with your experience of God? Does that match the God you know? Is that the God you came here to worship this morning? While I believe there is truth in this story and something for us to learn, I do not believe that God told Abraham to kill Isaac. That’s not the God I know. That’s not the God I came to worship this morning. That’s just not my experience of God. And while we are at it, I refuse to accept the worn out and heretical argument that there are two different Gods, an Old Testament God of law and violence and a New Testament God of grace and love. The God of Abraham is also the God of Jesus is also the God of you and me. There is only one God. So I want to explore this text not by asking what’s going on with God but by asking what’s going on with Abraham. By now most of you have heard enough of my preaching to know that when I ask what’s going on with Abraham I am also asking what’s going on with us. I’ve become convinced that at some level many, maybe most, of the thoughts, wonderings, rumblings, and rummaging around in our hearts and minds are a conversation with God. Haven’t you had times when it seemed God was speaking to you? Asking something of you? Haven’t you had times when you listened for God’s will? Haven’t you had times when you sought God’s guidance, clarity about your life, or wisdom for a decision? Haven’t you had times when you sensed something going on within you but couldn’t quite make sense of what that was? We probably all have. And in those times we want to be faithful. So did Abraham. We want to do what God asks of us. So did Abraham. We do the best we can at the time. So did Abraham. Sometimes we get it right, other times we don’t. So did Abraham. So what if this text is giving us a glimpse into the rumblings and rummaging around going on in Abraham’s heart and mind? Maybe we are hearing Abraham’s interior conversation with God, and being offered some insight about our own. You know as well as I that our conversations with God are not always as clear, direct, or easy as we’d like them to be. Sometimes it’s difficult to discern between our own voice and God’s voice. How do we know it really is God’s voice and not our own? I can’t help but wonder if Abraham was mistaken or confused about whose voice he was listening to. His certitude is what makes me wonder this. He is absolutely convinced he knows the mind of God, and certain of what he is to do. He doesn’t question, argue, or negotiate. Certitude has closed his heart, his mind, and his mouth. We ought to be wary of our certitude, when we are absolutely convinced that there is only one way and we’e got it figured out, especially in regard to the mind of God. Certitude should be for us a red light or at least a yellow light, not a green light to proceed full speed ahead. Abraham’s silence is not a sign of his faithfulness. Instead, his certitude became his silence. In the silence of his certitude Abraham arose early in the morning, saddled his donkey, packed a knife and rope, cut the wood, “set out and went to the place in the distance” (Genesis 22:3). Abraham was leaving his home. His heart had closed. His mind was made up. There was nothing more to be said. God’s heart, however, remained open. The open heart of God sent an angel and a ram. Certitude about the mind of God is a dangerous thing. It is the very opposite of faithfulness. It is at the heart of violence, prejudice, and fundamentalism of every kind. Certitude prevents change and growth. It excludes other possibilities, voices, and ways of being. Certitude isolates us and denies our need of others, including God. It puts us rather than God at the center of life and the world. Certitude closes hearts and minds. It is narrow rather than expansive, exclusive rather than inclusive. Certitude ends conversation. Did you know that after Abraham left the mountain in today’s Old Testament story there are no other stories in which God spoke to Abraham? If there is anything to be learned from today’s story it is that our certitudes must always be questioned, discerned in community, challenged, held lightly, and even sacrificed. Are we really hearing the voice of God or is it our own voice? Certitude distorts and perverts our faith. In faith we profess there is only one God, our certitude of that, however, often means that God is an American Christian. We have faith that God is with us but our certitude of that often means that God is with only those who look, speak, act, or believe the way we do. By faith we trust and experience God’s love for us. Our certitude of that often means that God does not love or accept those who differ from us. Surely, God is bigger and better than that. Shouldn’t we also be? Certitude lives in the extremes. It underlies many of the crazy things we say and do to each other. The risk of certitude is that it takes us to a place in the distance, a place far from home, a place where we are not fully ourselves and we do not allow God to be fully God’s self. We all have our certitudes about God. Abraham did. You do. I do too. What are your certitudes about God? Are you willing to sacrifice them? To let them go? I’m not asking you to sacrifice or give up your faith but to have the kind of faith that would sacrifice your certitudes: that would open you to a deeper understanding and experience of God; that would expand the presence of God in your life, the life of another, and the world; that would enlarge and continue the conversation. Maybe that’s what ultimately happened on the mountain that day. Abraham offered a sacrifice on the mountain. The text says it was a ram. But what if it was more than just a ram? What if the real sacrifice that day was Abraham’s certitude? Maybe that’s the real the reason we can call him the father of our faith. He sacrificed his certitude of knowing the mind of God, and trusted the mystery and the silence of God. What about you and me? What certitudes do we need to sacrifice in order to be faithful, to truly be children of Abraham? Whew, Father Mike–this is a whole lot to think about. In grammar school, we were taught that this was the meaning of sacrifice, so us little Catholic kids felt so guilty for our pettiness. But this really delves deeply into the story of Abraham in a totally new way. Thank you for this. Thank you Ellen. It’s always good to hear from you. In some way certainty is the opposite of faith. I am glad the sermon opened a new way of seeing this story. I certainly would not claim that it is the best or only interpretation but simply another way. I often wonder if these stories that are so hard to hear and understand are pushing us to expand and enlarge our seeing and thinking about who God is and consequently who we are. I really, really like this. I’ve always disliked the story of Abraham and Isaac and always believed that Abraham had it wrong. Growing up around fundamentalists, I knew many people who believed God was asking them to give up children, pets, nice cars, all kinds of things to prove their love for Him. I always imagined Abraham was like those fundamentalists. I suspect that sometimes the harder sacrifices to make are our own beliefs, prejudices, world-views, and behaviors. Your comment reminds me of Isaiah 1:11-16 — “What to me is the multitude of your sacrifices? … Cease to do evil, learn to do good,; seek justice, reduce the oppressed, defend the orphan, plead for the widow.” Thank you for your comment. Thank you for giving us a new perspective on this. I have struggled with why God would ask a parent to sacrifice a child, and finally decided not to believe it. Your thoughts on certitude makes a lot of sense. Thank you Beverly. I am glad this offered you a new perspective. I’ve never believed that the story as presented in scripture was the total picture. Any more than I have ever believed in the atonement theory of salvation. This could not be the action of the One I called God. I didn’t understand what I was reading but I knew I could not accept it. Thank you, Father, for shedding some insight on the Abraham/Isaac story. Rita, I am glad this offered some new insight but it seems you already had that. Stories like this I think push us a deeper understanding or at least to ask better questions. Otherwise we often end up with a manipulative and hard to trust God, and I just don’t think that’s who Jesus reveals God to be. I’m reading a book that just talked about this story too. Enjoyed! Thanks Whit. I am glad to hear from you and appreciate you reading my blog. Thank you for a new perspective on this challenging story. When I have preached on it, I have followed the interpretation that the writer was challenging the practice of human sacrifice that was current in Abraham’s time, but your reflection recalls an image I found in a sculpture by Ted Cornell, who lives in Westport NY. The full title of the sculpture is “The Angel of Inerrancy, conveying well-meaning souls to hell.” You can find the image on his website http://www.crookedbrookstudios.org. This the URL for a picture of the sculpture. I fully agree, this is a new perspective, that would not normally be thought to be shown in the Roman way of thinking!!! Thanks for sharing such insights, they bring about much to think about, and that is a good thing!!! Friar Peter, thanks so much for this image – The Angel of Inerrancy, conveying well-meaning souls to hell. There is a powerful and thought provoking warning in that. Maybe we can talk about this next week. The subject has been around for around 3000 years. I hope some of the group will have some insights. I still don’t like what God put Abraham through just to prove a point. Seems excessive, but I am not in charge–for sure. I cannot tell you how much I appreciate your sermons. Thank you. Thank you Mary for these encouraging words, and for reading my blog.